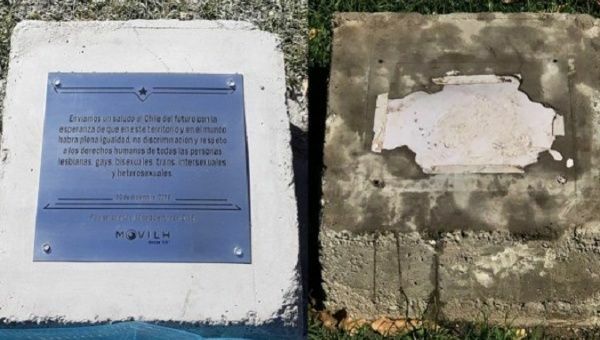 The ruins of Chile’s first monument commemorating sexual diversity were found Monday just 10 days after being erected in Santiago Hill, the Movement for Homosexual Integration and Liberation (Movilh) said. Engraved with words of hope for a future free from discrimination and illuminating the concept of mutual respect and equal rights for members of Chile’s LGBTI community, the plaque was put on display Dec. 10. By Monday morning, the monument was completely destroyed. Activists have requested camera footage from municipal authorities, Movilh leader Rolando Jimenez said. Earlier this month, the Council of National Monuments and the Municipality of Santiago, sponsored by the Museum of Memory, the National Institute of Human Rights (INDH), the National Council of Cultures, the Arts and the Heritage supported the idea behind the monument. Under the commemorative plaque, a steel capsule was buried with press files, videos, campaigns, human rights reports, photographs and messages from people and institutions in Chile and abroad, which will be uncovered in the year 2118. Be the first to comment on "Shrine to Chilean sexual diversity and inclusivity destroyed by haters"